The Bendigo Regional College of TAFE has developed over a number of years on land bounded by McCrae, Chapel, Hargreaves and Mundy Streets. In 1854 an acre site was secured by a Government grant for the Sandhurst Mechanics Institute and library, and in 1871 the Institute decided to set up a School of Mines. The purpose of such a facility was to provide scientific and practical training focussed on, but not exclusively related to, mining. This school was initially allocated teaching space in the Institute building, however expansion in the late 19th and early 20th centuries, necessitated the construction of associated buildings on much of the site. A timber framed, canvas pavilion, constructed in McCrae Street in 1854 to house an exhibition, was officially opened as the Mechanics Institute in 1856. In 1864 the first permanent Mechanics Institute, designed by Vahland and Getzschmann, was added to the west side of the pavilion. This contained a library, committee room and public reading room at ground floor level and a hall above. After fire destroyed the pavilion in 1865, it was replaced by a new section, and a further wing was added to the east in 1871. The newly formed School of Mines initially used space in the Institute building, and classes officially began in 1873. The resultant building lacked ornamentation, and in 1878 plans for the addition of a new facade and portico to the McCrae Street facade, by the architect WC Vahland, were approved. The completed building opened in 1879. The first building constructed for, and by, the school was a chemistry laboratory, designed by Vahland, which appears to have been completed in 1873. Additions were made to this laboratory in 1879 to provide space for metallurgical pursuits. Further additions were made to the building in 1891, providing additional space for metallurgical and assaying work. In the 1880s, three buildings, designed by Vahland, were constructed on the site. In 1884 a building, containing workshops and classrooms, was built in Hargreaves Street for the School of Mines. From 1885 -87 a library, octagonal in form, was built to the rear of the McCrae Street building for the Mechanics Institute and a three storey towered building, constructed to the west of the original 1864 building in McCrae Street for the School of Mines, was opened in 1890. It contained a public lecture hall to seat 600 people. In 1904 the School of Mines officially took over the assets and liabilities of the Mechanics Institute, including the library. 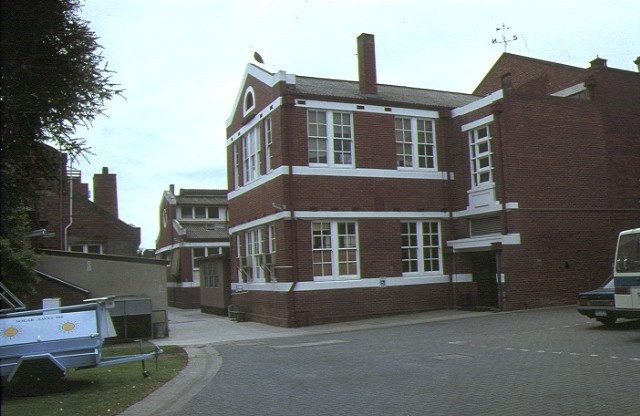 Senior chemistry laboratories were built behind the octagonal library, probably completed in 1912, and a new workshop building had been constructed to the east of the 1884 workshop building in Hargreaves Street by 1922. In 1926-7 a Junior Technical College was constructed at the east corner of the site, to accommodate classes which had commenced officially in 1913. Such schools were established to provide boys, who intended to pursue technical studies, with early training. In 1959 the School of Mines became the Bendigo Technical College, which subsequently became the Institute of Technology in 1965 and later a TAFE college. As noted, the prolific German architect, WC Vahland designed all the 19th century buildings on the site. After arriving in Australia in 1854, he established himself as an architect in Bendigo, and designed the majority of the city's important buildings. He became closely associated with public life in the city and as President of the Bendigo School of Mines and a part time lecturer, he was personally involved with the development of the School. The five buildings he designed vary in character. The unifying two storey facade, constructed in 1878, is symmetrical and incorporates a protruding central section with an arcaded entrance porch and framing vertical bays with segmental pediments and oculi. Classical in style, paired pilasters and half columns divide the facade into bays which contain arch headed openings and pedimented aedicules at first floor level. A balustraded parapet with urns crowns the composition. The adjacent 1890 towered building is complementary in style and is also crowned with a balustraded parapet with urns. Its three stories are clearly divided horizontally with the lower rusticated level incorporating arch headed openings and those above incorporating rectangular openings. A trabeated system divides the facade into bays. The corner feature of this building is a tower with mansard roof and dormer windows. Decorative panels incorporate festoons and at street level unusual strapwork is featured within the plinth. The 1884 workshop building in Hargreaves Street is of cream brick with contrasting render pilasters, cornice and pediment. The symmetrical facade incorporates concentric arches, reminiscent of Romanesque work. The 1887 library is a simple red brick octagonal building which lacks the usual 19th century external elevational treatment due to its location at the rear of the Mechanics Institute building. It does however contain a grand and exuberantly decorated interior, with glazed ribbed dome supported on eight Corinthian columns, themselves supported by an octagonal balcony and eight Tuscan columns. Decorative plasterwork, an early gasolier and gas light brackets remain in the space. The red brick chemistry and metallurgy laboratory building, is of practical design, with monitored roof form and decorative treatment confined to a pilastered and parapeted facade. The Bendigo Regional Institute of TAFE is of architectural, historical and scientific significance to the State of Victoria. The Bendigo Regional Institute of TAFE is of architectural significance for the group of 19th century buildings all designed by the distinguished German architect WC Vahland. Both the McCrae Street buildings display fine classical characteristics, while the library is a highly original interior space. The decoration undertaken by important artist and modeller, Otto Waschatz is a fine example of his work; other examples being the Town Halls in both Melbourne and Bendigo. Both the workshop and the chemistry laboratory are significant as remaining examples of Vahland's designs for practical buildings. They remain substantially intact as early examples of such buildings. The Bendigo Technical College is of historical significance for its associations with the early history of Mechanics Institutes and free public libraries, with early experiments in technical education, and with the prosperous early years of Australia's mining industry. Its establishment reflects the strong tradition of mechanics institutes and mining schools brought to Victoria by British migrants, with Schools of Mines being particularly popular in Victorian gold mining towns such as Bendigo, Castlemaine and Ballarat. From 1863 to 1900 the School of Mines at Bendigo was the centre of teaching of the mining and metallurgical sciences so important to the wealth of Victoria. 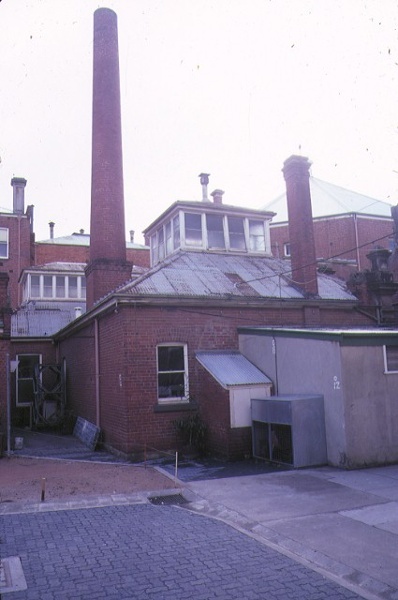 The Bendigo Technical College is of scientific significance for the metallurgical laboratory which preserves remnant equipment and as one of the earliest extant assaying laboratories. It conveys the importance of the place in the context of Bendigo's gold mining history. Technical College, including School of Mines Building, Chemistry and Metallurgical Laboratories, Classroom Block and Library, McCrae Street, Bendigo. The Lodden Campaspe College of Tafe comprises a number of significant buildings constructed for the School of Mines and the Mechanics' Institute between 1863 and 1912. 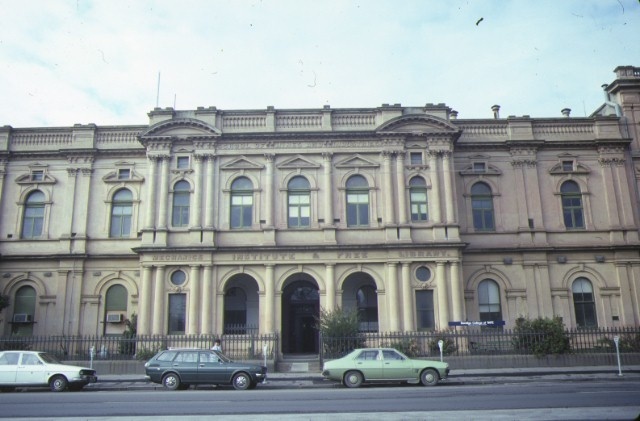 The first building to occupy the site was the Mechanics' Institute Library, completed in 1864, and designed by the prominent German architect who worked almost exclusively in the Bendigo region, W.C. Vahland. The current library dates from 1887 (the original building having been destroyed by fire a year after its construction). In 1904, the School of Mines took over the Mechanics' Institute, and its students obtained free access to the library. The School of Mines was itself established in 1871 under the auspices of the Mechanics' Institute, and after gainingaccessto the site, erected classrooms and a Chemistry and Metallurgy Laboratory between 1879 and 1892. A further chemistry laboratory, this time one for senior students, was erected in 1912. The draft statement of significance and the following history were produced as part of an Online Data Upgrade Project 2005. The Bendigo Technical College has developed over a number of years on land bounded by McCrae, Chapel, Hargraves and Mundy Streets. In 1854 an acre site was secured by a Government grant for the Sandhurst Mechanics Institute and library, and in 1871 the Institute decided to set up a School of Mines. The purpose of such a facility was to provide scientific and practical training focussed on, but not exclusively related to, mining. This school was initially allocated teaching space in the Institute building, however expansion in the late 19th and early 20th centuries, necessitated the construction of associated buildings on much of the site. A timber framed, canvas pavilion, constructed in McCrae Street in 1854 to house an exhibition, was officially opened as the Mechanics Institute in 1856. In 1864 the first permanent Mechanics Institute, designed by Vahland and Getzschmann, was added to the west side of the pavilion. This contained a library, committee room and public reading room at ground floor level and a hall above. After fire destroyed the pavilion in 1865, it was replaced by a new section, and a further wing was added to the east in 1871. The newly formed School of Mines initially used space in the Institute building, and classes officially began in 1873. The resultant building lacked ornamentation, and in 1878 plans for the addition of a new facade and portico to the McCrae Street facade, by the architect W. C. Vahland, were approved. The completed building opened in 1879. In the 1880s, three buildings, designed by Vahland, were constructed on the site. 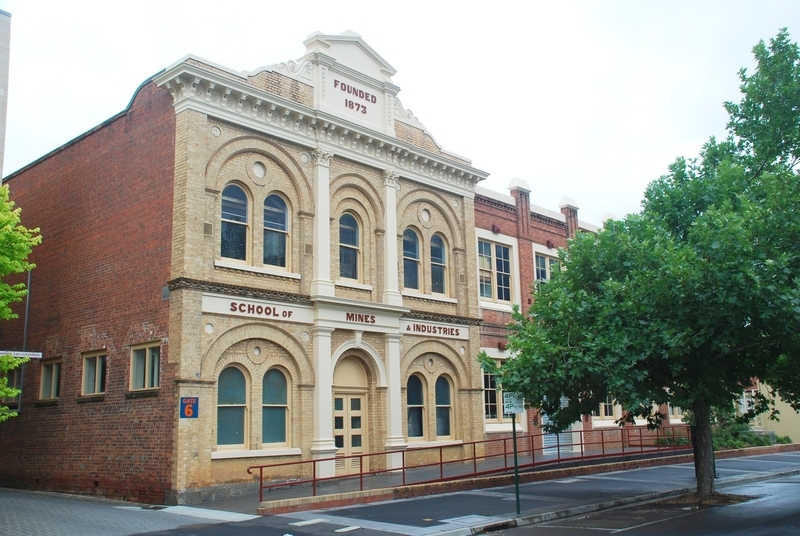 In 1884 a building, containing workshops and classrooms, was built in Hargraves Street for the School of Mines. 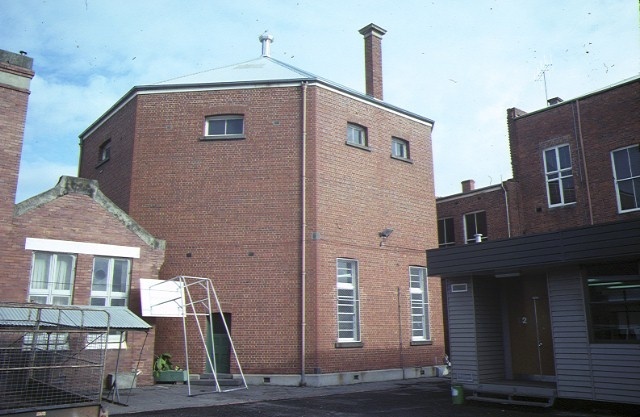 From 1885 -87 a library, octagonal in form, was built to the rear of the McCrae Street building for the Mechanics Institute and a three storey towered building, constructed to the west of the original 1864 building in McCrae Street for the School of Mines, was opened in 1890. It contained a public lecture hall to seat 600 people. In 1904 the School of Mines officially took over the assets and liabilities of the Mechanics Institute, including the library. 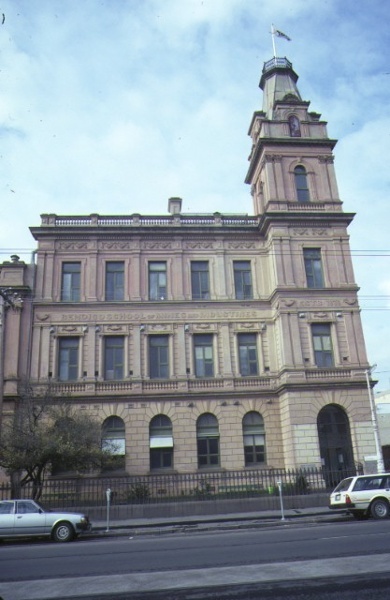 Senior chemistry laboratories were built behind the octagonal library, probably completed in 1912, and a new workshop building had been constructed to the east of the 1884 workshop building in Hargraves Street by 1922. In 1926-7 a Junior Technical College was constructed at the east corner of the site, to accommodate classes which had commenced officially in 1913. Such schools were established to provide boys, who intended to pursue technical studies, with early training. In 1959 the School of Mines became the Bendigo Technical College, which subsequently became the Institute of Technology in 1965 and later a TAFE college. As noted, the prolific German architect, W. C. Vahland designed all the 19th century buildings on the site. After arriving in Australia in 1854, he established himself as an architect in Bendigo, and designed the majority of the city’s important buildings. He became closely associated with public life in the city and as President of the Bendigo School of Mines and a part time lecturer, he was personally involved with the development of the School.